Introducing, the DARING COOKS (click on the Daring Kitchen link to the right for more info)!!! And for our first assignment - Ricotta Gnocchi! Daring Bakers founders, Lis and Ivonne lovingly chose the Zuni Cafe recipe for us to tackle for our first Daring Cooks challenge. Some DC members then upped the challenge by announcing they were making their own ricotta cheese! Well, who am I to not take a cooking/baking challenge? We're making ricotta cheese first, People! Easy though: Boil milk, cream and a bit of salt. Once it boils, pour in some lemon juice. The juice will cause the milk to curdle. Once it curdles enough you merely pour the mixture through a [very] fine sieve/cheesecloth/both. The sieve will collect the curdled, well... curds! 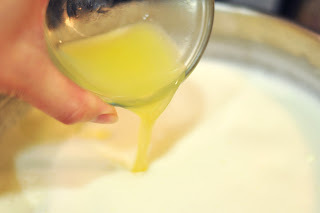 Once thoroughly drained, and squeezed, and drained some more, you have RICOTTA CHEESE! Incredible! Zuni's ricotta gnocchi recipe was not overly complicated - but it seems the biggest surprise to the group was that gnocchi does not always contain potato! These light, soft little pillows were made up of the ricotta, eggs, a little butter, a smidge of Parmesan and some seasoning. And that's it!! IT!!! I seasoned mine with a bit of nutmeg - a wonderful earthy, mild, spice. I decided to use my ricer, but in hindsight should have just pushed it through a strong strainer. 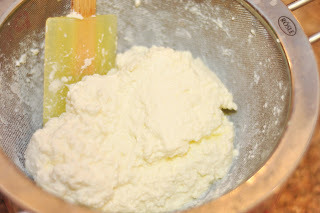 I had to whisk and beat it more since the ricer actually created larger "pieces" of ricotta in the batter than a strainer would have. But it was fun - like play-doh!! While potato gnocchi are formed by making a long, thick rope with the dough and then cutting little nuggets, these ricotta ones are done quite differently. Since the mixture isn't a dough so much as a thick, sticky batter - it'd have to be different! We scooped dollops and handled them with heavily floured fingers to avoid a big sticky mess. I got into a rhythm and was able to form all [um, 60ish?] of them quite quickly. The recipe basically asks you to do a round of user acceptance testing (oops - it's been a really busy month at work). 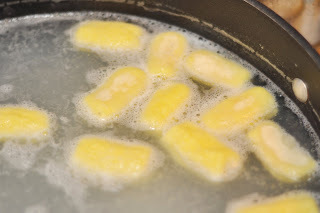 After forming 1-2 of your first gnocchi, boil them gently for 3-5 minutes and taste to see if you like the flavor/texture. So........ er.............. after my first sample - I didn't like the texture. A bit too soft and fluffy - almost like boiled egg white. But then when you think about what's in these guys (um, soft cheese and egg) it's not really too surprising. Flavor was awesome though! 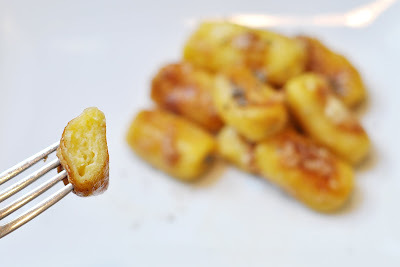 I added 1/2-3/4 cup of flour to firm up my gnocchi and liked them SO much better. Still soft, still fluffy, but no longer like boiled egg whites. Mmmmm and GOOD. I wanted to keep my sauce simple so that it didn't weigh down these amazing little pillows of ricotta cheese. So cliché but I opted for a sage brown butter. And *duh* forgot to buy sage leaves at the store so I did it with dried sage leaves out of my spice cabinet. It still tasted great but none of those fantastic crispy fried sage leaves to fancily sprinkle on top! I melted a few tablespoons of butter, added in ~1 teaspoon of dried sage leaves and some chicken broth. Simmered it down a bit and then strained out the sage (normally they'd be these nice big leaves that you could just pick out with tongs and serve on the side). Instead of pouring it on top, I sautéed the gnocchi in the sauce with a small handful of Parmesan cheese. They got brown and delicious with those bits of fried cheese. These were fabulous! AMAZING! I'm putting 1 gallon of whole milk on my grocery list right now as I write this cuz I want to make some more NOW. Absolutely fantastic. Incredibly delicious. 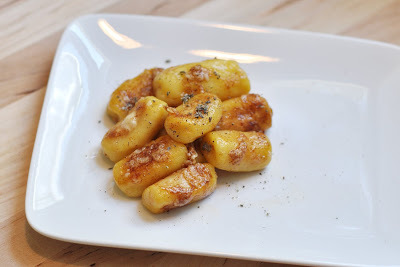 I liked these better than any potato gnocchi I've ever eaten. I would highly recommend making these - even if you have to buy your own ricotta instead of making it at home. They were fantabulicioso. Of course I'd suggest you throw in that extra fraction of a cup of flour too, but that's me. You should be able to find the recipe on either Lis's or Ivonne's blogs listed near the top. And of course, I must thank - profusely - Lis and Ivonne... our ever faithful Daring Kitchen founders who have somehow found a way to up the ante and make this group even better. We have a beautiful new website and now even a new group! I hope I can find the time (what was my blog called again?) to continue on, both Baking and Cooking... a little urging from you all wouldn't hurt either! Happy Baking. Happy Cooking. And Happy Gnocchi! What perfect looking gnocchi! I love the fried version... Yummy! I had a lot of fun with the Daring Cooks challenge too...can't wait to see what's next! Yours look great! A tasty classic with butter and sage. Your variations on the gnocchi are fabulous. I've never had gnocchi before, so I'm learning a lot from reading about results such as yours. Thanks for sharing! Your final dish looks wonderful. Great job on the first daring cooks challenge. I didn't realize that making homemade ricotta was so, well I don't want to say easy, but that it looks like something I could actually attempt with some success. I'm going to have to try to do it next time as my gnocchi turned out a bit strange since my ricotta was way too wet. Mmmmmm! Great job! Those look delicious, great pictures! 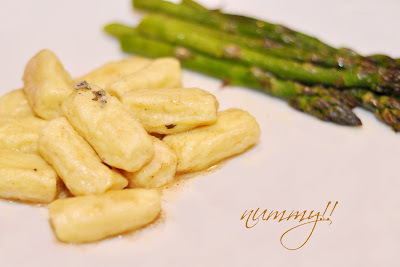 Your gnocchi, photography..I don'y even know where to begin. Everything is perfection and looks so yummy! woww, fried gnocchis! What a wonderful idea, thanks for sharing! 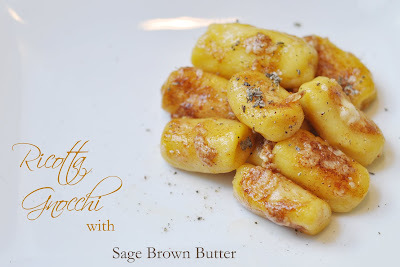 I love your gnocchi and the title of your post! Very catchy and tasty. Your gnocchi looks perfect. Mine was a disaster. I wonder if the secret is homemade ricotta. Many of the Daring Cooks made their own cheese, so I'm wondering if that was my first mistake. Kudos for your lovely results. Your pictures are just gorgeous I want to reach into my screen and eat your gnocchi! Mmm, your gnocchi look amazing!! I'm glad that you liked them, your photos are gorgeous =D. I got 18oz from half a gallon of milk and 2 cups of buttermilk. 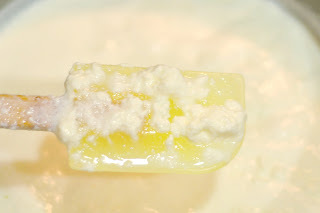 Once I didn't quite heat the milk enough and got very little curds. Since then I always bring the milk to a simmer and let it simmer for few minutes, mixing until I can see the separation of the solids and the serum. I live in the bay area too! I love the browned gnocchi. Everything look so fabulous! Great job on the challenge and the photos!